Last year, I became entranced by Kerfe’s 100 Grids Project at Method Two Madness. Please check her project out if you haven’t seen it – they’re the most beautiful grids I’ve ever seen. Nina and Kerfe are good friends, and post their artwork (and even musical performances!) on their blog. 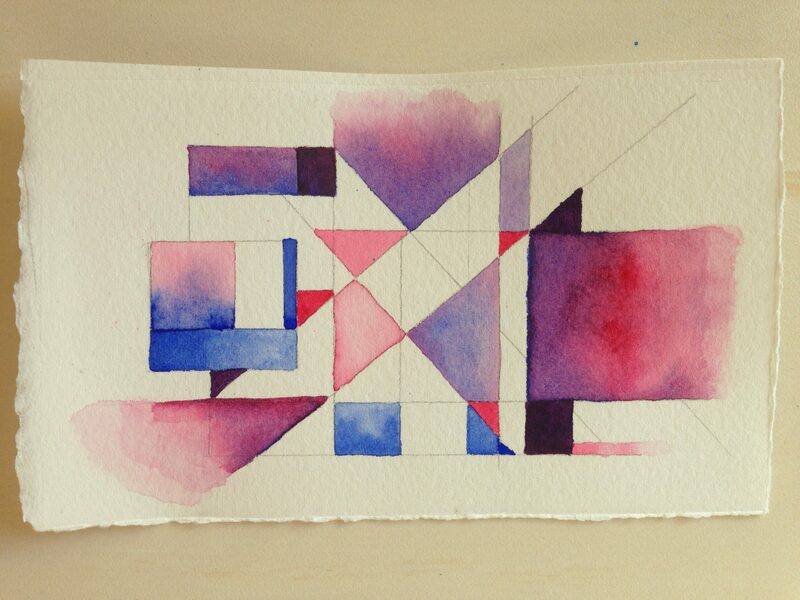 Her grid project led me to embrace the idea of geometric artwork. Coincidentally, I’ve been doing informal color studies lately, particularly with M. Graham’s Ultramarine and Prussian blues, combining the colors wet in wet, and letting them mingle together on the page as they dry. I was much more pleased with this one, and now I may take Margaret’s advice (and Hub agrees, too) and go larger. I’ll be working my way to larger paper as I learn how to compose paintings with a ruler, which is a new one on me! Mainly, just learning more about how various pigments behave, how they mingle on the page together, and most importantly, how to get various effects in and with my paint and brushes. Hopefully the paintings will become a bit more exciting as I go! I want to thank you all for your encouragement and friendship as I find my path, more and more, as an abstract painter who also loves to draw realistically. It’s kind of weird with one foot in each ballpark, but it’s kinda the story of my life, so why should art be any different?! I’m still feeling like a kid at an amusement park every time I pick up a paintbrush. I hope you find time today to do something that gives you the same feeling. Happy Tuesday, and May the Pigments be With You. Peace. Thank you so much, steph! Really glad you enjoyed and took the time to let me know! Thanks, Lucy! You are inspiring me too! Wow, I love these Laura. Its wonderful to see your pencil line mixed with bold colors. Really beautiful compositions. This is great Laura! Rulers and compasses are good tools for abstraction. I like how you blended the colors within each shape, it gives a lot of dimension. We’ll get Nina going. We all have life and funks to deal with at times. these are GORGEOUS Loo! You make me want to get out a pencil and ruler and color geometric patterns!!!! LOVE IT! Thanks for sharing the tip on the free shipping. I might just take advantage!! 🙂 Beautiful colors and design and thanks for sharing your journey. I’m so enjoying it with you. Yes!!! Oh you nailed it with that one. Stunning work! I love how you have wrangled your abstract with the lines and shapes, and the fine white border on some of the shapes really helps with dimension and “pop.” Such fun and so striking! I had no idea that geometrics are under your spell! love them both but especially your last one and it is larger…..even if it is an inch…..yes! slowly but surely, you’ll see…your confidence will be building. Love “May the Pigments be with you!”…..yep…..better be I am off to go paint at a cemetery! can’t wait. Thanks, Margaret, for sharing that link. I’ve seen a few of those but not all and I should definitely watch them again! So glad you’re enjoying them! Don’t you love how gracious artists are on YT? So much great stuff out there. I know isn’t it great? Yes!!! We have a lovely community, inside and outside wp. It is interesting to follow your artistic journey. Laura, I need a map! I shall embrace the diagonal line. I like both of these. The geometry really gets me. Plus, I’m a great fan of how you make your colors blend and isolate. Love it! Thanks, Kirk! I’d like them to be a bit more cohesive; hopefully that comes with practice. And that last line was a typo I didn’t catch in edit. I thought I’d deleted it but mobile wp apps are weird sometimes. Hehe. Glad you like this, I’m always curious what you’ll think of my abstracts. Your reactions sometimes feel like whole novels! Your abstracts really get to me. Thanks, Kirk, but I think it’s what your imaginative writer’s mind brings to the painting as much as the painting itself. I just love when you tell the story of what you see. It’s like a book I could dash off to read right away. This is fantastic, I love the top one especially, very mondain style, but much prettier ❤️ Love the softness with the near lines. You’re way too kind but thank you!! Carrie, I don’t think I could survive the election season without art. No stopping anytime soon! Thanks, glad you like! I wasn’t sure how they would be received. Definitely feeling my way as I go. Oh yes I hear you. Coloring in geometric shapes are difficult enough and you immediately went up the difficulty meter by doing it small scale. Go go go Laura! Woot! Woot! Thanks so much! This was fun, more to come, I hope. Wow It’s looking lovely Laura 💜Top one is my fev! Love the composition and blended colors too! Thanks Snehal! So glad you like these! It’s a trick to find a pleasing composition. Thanks, Taia! I like them too. Love those pinks and purples. I really like these geometries. And the colors are great. Your adventures make a great read. Thanks, Teri, I’m having fun! Who’da thunk? I was in love with acrylics at the end of June, and now I feel like a two-timer lol. I like the straight lines and geometric pattern to this. I giggled when you said planning…gasp. I feel ya!!!!! Wow, Dawn, woo! I guess his medium is oil? Wow, he’s pretty incredible, really glad you shared that link. Every thing I try, I feel like I could just keep going but then I’m so art-ADD that I wind up on something different again. I should really study his stuff because it’s really interesting to see how he composes. It’s pretty tough to come up with a really interesting and pleasing, yet cohesive composition by adding lines. I’m not much for thumbnail sketching but if I stay with geometrics I think I need to start. Does he make you wanna try this kind of work too? I think his stuff is gorgeous and I love his colors! Oh my goodness. It does make me want to try. I have watched a few of his videos and I think he is pretty darn cool. Ooh I hope you do!!! I don’t see how anyone could not be inspired by him!! I think eventually I will…he is quite inspiring. I want you to!!!! Lol!!! The great ones always make it look so easy. And he works very large. Part of your dastardly plan to get me to triple in size lol. OH I am too! Its all about the fun. Your geometrical are good for the eyes and soul Laura. Your color choices are perfect for these to paintings. Here’s to a beautiful day. Wow nice! I love you all painted up in geometry!! hehe… these are fabulous! Yeah… go BIG! Can’t wait to see what you make! you’re welcome LL…. I really love your Voice. Your geometric art approach. it says “LAURA” it is unmistakably …yours. and I love that about your art work. Fabio, you are too kind and what a sweet thing to come in here and say. Thank you very much. Have a beautiful day! Love this. It reminds me of Klee – & conjures up associations of garden flowers through a window. Thanks, Nexi, really glad you enjoyed! I plan to do more of these. Beautiful! 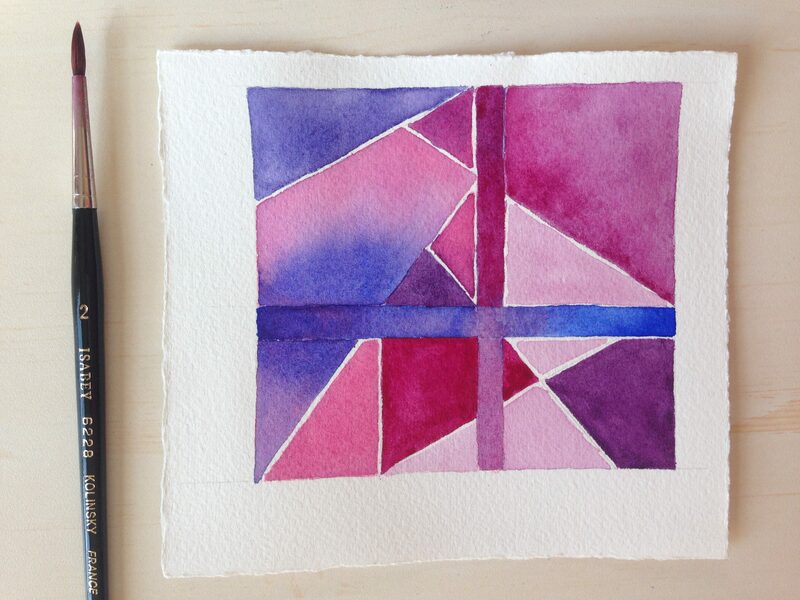 Geometric color patterns are so fun to paint! They are a blast! Thanks Brianna! Thanks, Jeanette. I’ll take a look!